I make the students write an analysis about the changes in Bill Murray’s character, Phil, who goes through a life journey by reliving a single day. (Sometimes good insight can slip in a door that looks like fluffy pluff.) 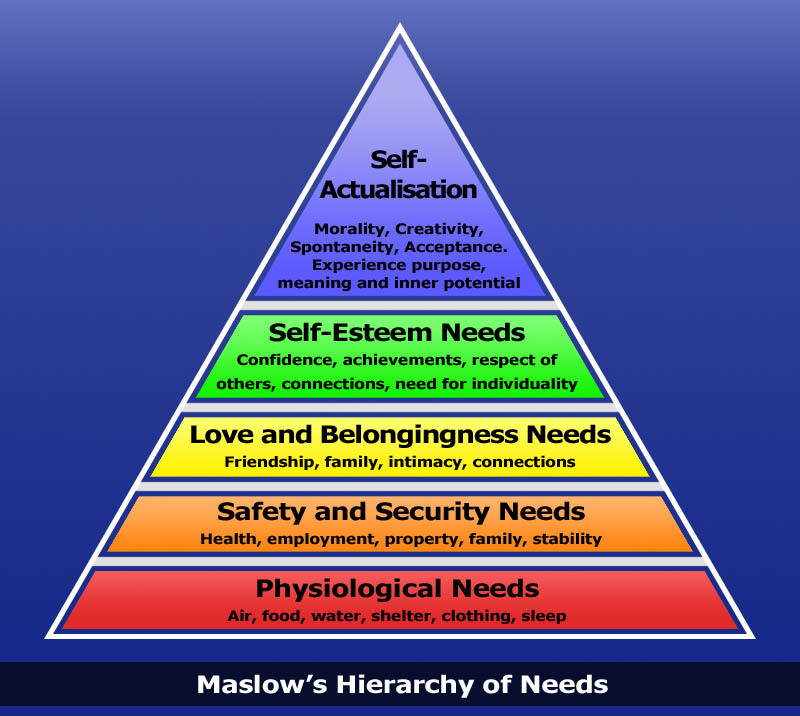 While discussing the movie, I often found myself using the phrase SELF-ACTUALIZATION and remembered that the phrase came from Maslow’s Hierarchy of Needs. When I first learned about Maslow’s theory in high school, his outlook so fully articulated the consensus of the life path within our modern culture that, at that time, I internalized “belief” in this chart without realizing it. The basic idea implies that we need to start at the bottom and work our way up in life. In this theory, we first figure out how to make enough money or situate ourselves to get our basic needs met, then we can gradually get all the other stuff on the pyramid, working up to greater levels of psychological and spiritual development in the process. My life has led me up and down this pyramid over and over again, wiping out whole rungs at a time. The way I see it now, some of the levels of this pyramid can actually get in the way of self-actualization, concepts such as security, achievements, belonging, safety, self-esteem! These concepts are rabbit holes of delusion, stories of a false self, each one of them. Think about how many are living by this idea. Think how conditional self-actualization would actually be, according to this chart. First you get enough physical security, then enough conditional love and acceptance from others, then enough status and respect, then finally, you are ready to learn who you really are enough to find purpose and meaning. This is one of the lies that constructs our world. You cannot find enough security, acceptance, and status to know the self; it isn’t even the right trail, yet most everyone is marching around as if this were true. If you know the true self, you don’t need the other steps to prove your worth. You take another journey altogether, a journey that doesn’t require you to be GOOD ENOUGH to know yourself. The bloody pyramid is a constructed mental HELL…sorry. Seems to me that self actualization in the human journey could be the first step, and then the other needs would either take care of themselves or become irrelevant. Or do we need to go up and down the pyramid steps a bit in life in order to learn to point toward self-knowledge? And what about this term SELF-ACTUALIZED? The path of remembering (the TRUE self beyond this world of duality) takes away the faulty concept of the constructed self so perhaps it should be, ACTUALIZATION of the NO SELF. It is amazing for sure!! We start at the bottom and work our way to the top right? Well if you take Maslow’s chart and flip it upside down, that I believe is the truth of the adventure of learning what it means to be a human BE-ing on this planet. If you superimpose this way of thinking over the illusion of limitations purposefully taught with the chart the other way around you get a beautiful Star of David symbol. I think that is one of the deeper, true meanings of that important geometry… we focus starting with the tip at the bottom and then can easily work our way up to the base :). While I typed this post, I was remembering my old MAC from 20 years ago that had macpaint and I wished I could illustrate with a drawing. ooh,yes, I love the sacred geometry of your overlay here! 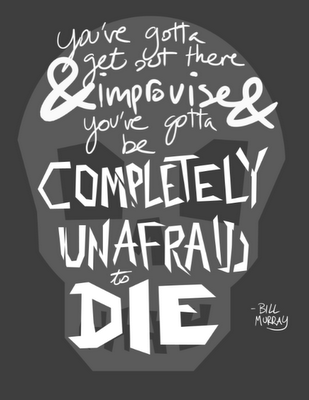 Take it to the 3 or 4 d and it becomes such a dynamic shape to step into and play with! Thank you! Love the view from your eye! These words that I saw this morning connect to your/THE QUESTION; who is climbing, indeed! “When the question ‘Who am I?’, ‘Where am I?’ is asked, eventually it is landing Nowhere. No one is collecting this Question. No hands go up and say: I am here. And in the space of the non – finding of the one appearing previously to be there, there is joy, there is an expansiveness and peace. You know you are, but as what you cannot say. And something moves from within by itself. And it cannot be regulated or systemised. When people ask you what you want to do in the morning, you will see, it is so funny. How can anybody know such a thing? I love that, actualization of the no-self! Brilliant 🙂 My problem lately has been that I think I have to solve all my psychological neurotic issues before I can be actualized, but its not true, because that’s not “me”. I am the one who sees the neurosis, but I’m still identifying with that so then I think I must transform myself. It’s far better to remember that there is no self to transform! Actualization of the No Self. Yes! Yes, it can feel like an endless fixing fest sometimes! I was thinking on my car ride this morning how perfect everything is except my thoughts, then I thought, but my thoughts are perfect because they are revealing in their unreality, then they too point to the perfection. And like Soul Doula so expertly points to, sometimes the thoughts of no self can cause one to not engage fully, which too can be perfect cause life, body, 3d “don’t” let you disengage for long! 🙂 Back in we are thrown. For me it is the space of nonidentity that lets me live my life moment to moment…and I chose a very interactive life for right now with 2 teenage daughters as we dance in and out of the matrix together. No cave to hide in, no saffron robe to wear 🙂 OYE! So deeply appreciate your sharing here with me 365! I love it! It is ALL of it. I am finally able to participate so fully in this life, on my bicycle hummer 🙂 because I often don’t have a horse in the race. I needed a little wedge from non dual teaching to help me then jump back into the rain/shine/tornado experience of being a body with a life so I could participate in the flow instead of resisting the flow. Such a paradox. Thank you for spring boarding off this paradox with me! Quite right. It is all of it. And so a paradox. What a ride, eh? Thank you very much for the nod my direction and for the inspiration your writing provides! Just finished my annual viewing of Ground Hog Day. The hero’s journey indeed! Your perspective on Maslow’s Hierarchy of Needs is quite interesting. One definitely jumps from rung to rung, there is no orderly progression. Sometimes the need to feel important, usurps the need for shelter and undermines the patience and perseverance one must take to fulfill the needs that are situated on the bottom rungs. I say this from the perspective of having run a homeless shelter. Self-actualization and esteem can be very high among some of the unsheltered population. I would love to hear more about your perspectives from those experiences. Often, I have seen the wisest can walk humbly at the bottom while the empty can lord over on the top. Thanks for the sharing, Cheyenne! Maslow was always too abstract to me. By the time you get to the self-actualisation part, you’re too darn worn-out to be creative and spontaneous. Morality starts , if at all, at the physiological stage. Thanks for the follow. I’ll be back. Yes, pyramid doesn’t really get at it! 🙂 Nice to see you, here. Thanks for coming over. I’ll be back you way as well. Thank you for linking! I really enjoyed your take on Maslow. So many perspectives!